Visier Inc. Releases New White Paper "Workforce Analytics: The Critical Factor to Improve Your Company's Performance, Profitability and Human Capital Investment." In such a competitive landscape, workforce analytics are no longer a "nice to have." For organizations that want to achieve best-in-class status and maximize their performance and profitability, workforce analytics have become a "must-have." Visier Inc., announced today the release of a new white paper "Workforce Analytics: The Critical Factor to Improve Your Company's Performance, Profitability and Human Capital Investment." With workforce analytics, HR professionals can play an even greater role in their organizations to help direct senior management and hiring managers in connecting the dots, between their company's overall performance and their investment in their workforce. Equipped with powerful workforce metrics, HR leaders can clearly identify and communicate to the "powers that be" precisely where their company's investment in human capital is paying off and, more importantly, where it is falling short and why. Visier Workforce Analytics is an end-to-end, cloud-based application designed for HR professionals to easily identify and improve the ROI of their organization's human capital. Companies can reduce costs, improve productivity, attract and retain top talent and implement a workforce strategy that supports the business strategy. Visier Workforce Analytics is a powerful, intuitive and interactive solution that uncovers deep insight into the core metrics of your workforce, by answering the most critical and fundamental questions facing HR professionals about their workforce, and more importantly, with predictive what-if analysis helps to predict and plan for their future needs. "People are what makes companies successful. People are also the most complex and expensive asset for an organization. HR professionals have always understood this principle, that people are the most critical element to a company's success," says John Schwarz, Founder and CEO of Visier, Inc. "Organizations are experiencing the increasing demand to integrate successful workforce analytics as part of their human capital management and workforce strategies in order to capitalize their investment in their workforce. With workforce analytics, they finally have the tools necessary to turn that knowledge to action." Companies must align their people strategy with their business strategy in order to be successful and profitable. When integrated with business analytics, workforce analytics improves an organization's human capital ROI and increases the value its workforce delivers to its overall performance. Analytics is the critical key that allows organizations to be responsive and flexible and ready to meet the ever-increasing challenges in today's marketplace — as well as tomorrow's. The Big Shift to Strategic HR. How HR professionals can use workforce analytics to play a more pivotal role in their organizations help direct senior management and hiring managers in "connecting the dots" between their company's overall performance and their investment in their workforce. Where to Begin: The Key Three. Which metrics should organizations be tracking to provide them and their organization with the greatest value. Workforce Analytics — Tools and Technologies. By implementing a complete, end-to-end workforce analytics solution, organizations can get an accurate birds-eye view of their workforce and use the data to guide them in fact-based human capital decisions and strategies. 4 Key Recommendations in Selecting a Workforce Analytics Solution. 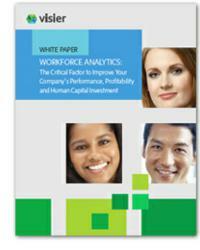 To read this complimentary white paper, "Workforce Analytics: The Critical Factor to Improve Your Company's Performance, Profitability and Human Capital Investment," please visit http://info.visier.com/white-paper-workforce-analytics-improves-profitability/?utm_campaign=HR.Marketer-Profitability-White-Paper-PR&utm_source=Press%20Release. Headquartered in Vancouver, B.C. and Menlo Park, Calif., Visier delivers workforce analytics through the cloud to empower HR professionals with the most critical insights for optimizing their people strategy to meet their business strategy. Visier's unique analytics combine the sophistication of predictive capabilities with the ease-of-use of consumer applications. Founded by business intelligence veterans—including former Business Objects chief executive officer, John Schwarz—the company's leadership team has a proven track record of technical, operational and strategic management success with companies such as IBM, SAP and Symantec. For more information, visit http://www.visier.com or call 888-277-9331.